Of all the things that’s expected of leaders, the most fulfilling, and hardest thing to do is to be a good boss. Nothing challenges a manager more than having to give negative feedback. In fact, it’s so difficult and awkward that most of us either completely botch it up or avoid it altogether. Neither of which is good for the employee or the business. And it certainly doesn’t help your leadership reputation either. 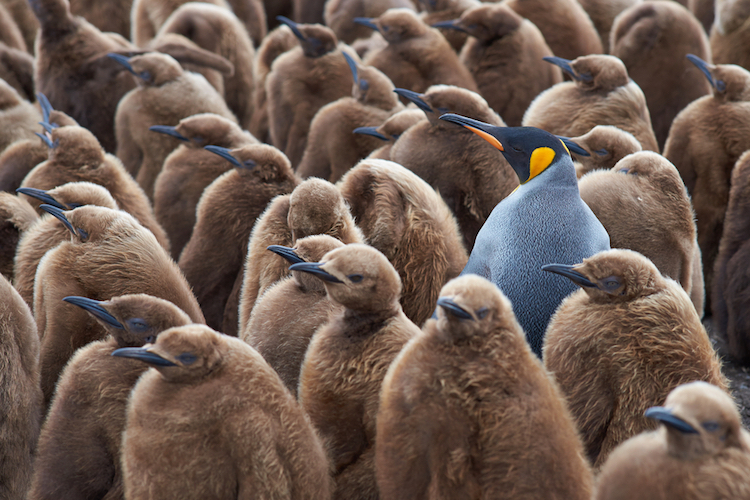 As a manager, you do your team a great disservice if you make the mistake of equating being likeable as the same as being a good boss. The challenge is how to deliver criticism that is specific enough to help our people grow, yet delivered in a way that doesn’t completely shred their confidence and self-esteem. Or make them hate us (and yes, most of us want to be liked). I call this practising tough love. Kim Scott calls it Radical Candor in her book by the same name. Scott through her years of experience at Google and Apple witnessed excellent and horrific examples of leaders delivering difficult feedback. She leveraged this learning to develop a tool for giving guidance, which she calls radical candor. 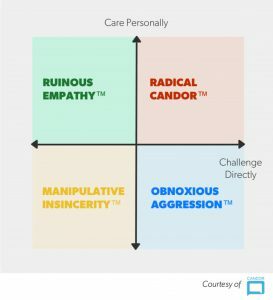 Radical candor is the ability to give candid criticism without damaging relationships. Scott recommends the best way to do this is to demonstrate that you care personally and be willing at the same time to challenge directly. Master both and you’ll deliver constructive criticism that doesn’t blow up in your face. Unfortunately, most of us avoid challenging directly as we fear we’ll hurt feelings or risk being disliked. As a result, we fall into the quadrant of Ruinous Empathy. We may be a likeable boss but we’re certainly not a good boss. Or we swing to the other extreme of providing forthright feedback but without making the effort to show that we care for our employee’s well being. Thus we demonstrate Obnoxious Aggression. In essence, we become jerks. Kim Scott shares her model in this video with interesting stories to illustrate each quadrant. I think you’ll really enjoy hearing Scott’s experience of tough love from Sheryl Sandberg (which later inspired her model for Radical Candor) and her own experience of Ruinous Empathy. Wanting your team to like you is human. But don’t forget that as a leader, you also have a responsibility to help them develop to their full potential.